The flagship. Made from 100% Xinomavro ungrafted vines. A sparkling blanc de noirs with the traditional method. Unfiltered. Razor sharp and very aromatic. Expressive nose of citrus, stone fruits and herbs. Everlasting bubbles. Aged for at least 12 months on the lie. Riddled and disgorged by hand. 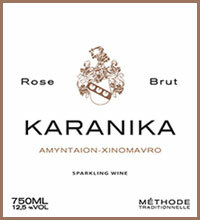 It was only a matter of time before Karanika decided to make the Assyrtiko sparkling with the traditional method. Not on its own, but blended with 30% Xinomavro. A Champagne style blend without any additives. Highly elegant and subtle. Not so much body but very rich taste. Refreshing acidity, and rich nose with lime, chamomile, pear brioche, and nutty in the end. Very long and impressive length. Aged 24 months on the lie. Riddled and disgorged by hand. Brings out the best of Xinomavro. Wild roses and strawberries, framboises dominate the nose. Explosion of fruit in the mouth. Acidity is tempered by creamy texture. Everlasting string of pearls. Matured between 6 - 12 months on the lie. Riddled and disgorged by hand. 100% Xinomavro, ungrafted, exclusively from our organic vineyards at the Rasto area overseeing Lake Petron. Impressive sparkling wine, with a complex nose of stone fruit, lime and grapefruit. High acidity and very mineral. Moderate yeasty foundation. Crystal clean, focussed with an extended aftertaste. At the moment we release the Reserve that is aged for 12 months. Over the next years the ageing will extend to 48 months. Riddled and disgorged by hand. The absolute best example of what a blanc de noirs can offer. We release this label only in the better vintages, the latest bottling is from the 2013 harvest. What an amazing year that was! Elegance pur sang. 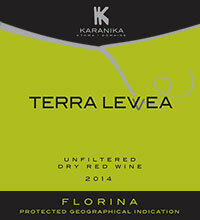 This impressive dry red wine is a blend of our best XInomavro, from the old vines, with Limniona. A 50-50 blend, that brings out the best of both indigenous varieties. It is an uncompromising wine with the unmistakable XInomavro characteristics of ripe blackberries, leather, vanilla sundried tomatoes and roses. But it bears also the minerality, spices and ruby colour from Limniona. The wine is medium bodied with a long and complex finish. Fermented and aged in French oak for 12 months. The wine is unfiltered, apart from a small sulphite addition, totally natural. This dry red wine is released only in the absolute best of vintages. 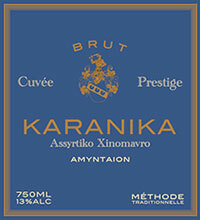 Latest release 2013 - an iconic year for xinomavro in Amyntaio. This xinomavro is a dream come true. Only once every 10 years one can find this complexity, balance, phenolic ripeness and extract in a wine, without manipulation whatsoever. 93 points in the Wine and Spirits Magazine. Very aromatic: red berries, dried tomatoe, spicy and floral in the nose. These aromas come back on the palate, lots of tannins, but very ripe and soft, deep ruby red, no sign of ageing, endless aftertaste, medium body, complete ripeness with only 12,5% alcohol. Amazing. Can age for the next 20+ years. Our most easy-going red wine. Organic and unfiltered, of course. A blend of Xinomavro, Limniona, and Cabernet. This is a fruit focussed wine with just few tannins, fresh acidity, and breathtaking aromas. Red fruit aromas from Cabernet and Xinomavro, with spicy notes and aftertaste from LImniona. Medium bodied.. We suggest to drink this wine slightly cooled. An ideal summer wine. Although we are restricted because of the decision not to use additives to correct any faults, we can release this wine almost every year... fortunately. 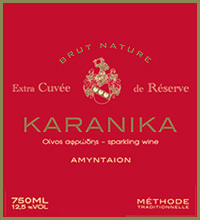 This highly aromatic wine brings out the best of assyrtiko. Intense fruity and flowery aromas like apricot, honey, chamomile and citrus blossom. Velvety almost fatty mouthfeel. Pleasant acidity with an impressive length. We suggest to be patient and not open this wine immediately, if possible. The best years are yet to come. Wine from Assyrtiko has to be opened, if vinified correctly, after a couple of years in order to achieve maximum complexity.